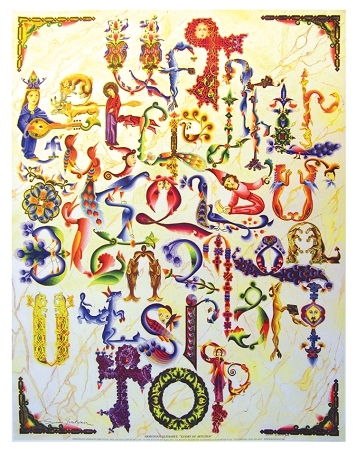 Glory of Aypupen is Siroon Yeretzian's creative rendering of the Armenian alphabet. She follows in the footsteps of great scribes who illuminated Armenian bibles with unrivaled skill. Their work, using animal, bird and saint-shaped letters, is part of a unique Armenian artistic heritage to which Yeretzian also belongs. This poster is the perfect addition to any home, library, hall or school. It measures 22 by 28 inches.